Are you judging potential Valentines based on their … baskets? If so, British supermarket chain Tesco has the perfect campaign for you. BBH Live put out a call for a range of single folks—not actors—and asked what they'd put in their shopping baskets for a Friday night at home if they had £20 (about $30) to spend. "It was all based around two insights," BBH's Kate Murphy tells Adweek. "One: that what's in your shopping basket says a lot about you as a person. And two: that you are more likely to find love in a supermarket than a nightclub. We then just worked out a process of how we could test that." Ultimately, the agency sent four couples on dates. Murphy says two got on well, while two others did not. That's a pretty respectable matchmaking percentage. One couple actually plans to meet in Nepal in a few weeks. What's the big takeaway for viewers? 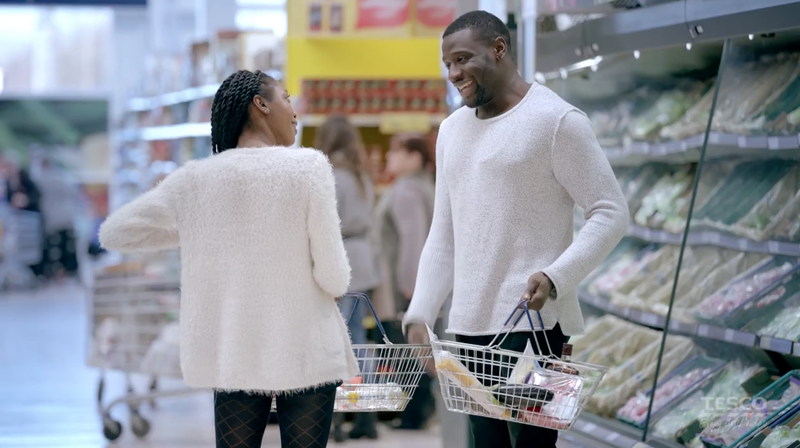 According to Murphy, "We want them to feel that Tesco has been brave and gone against the grain by talking about singles, rather than pushing out the same old couples messaging." That seems totally on brand. Dating can be scary sometimes, and so can shopping at Tesco.